Dr Kaye Morgan is a Victorian Postdoctoral Research Fellow in the School of Physics at Monash University, and is currently on a two-year visit to TUMunich in Germany as a Hans Fischer Fellow. Growing up in suburban Melbourne, Kaye enjoyed both science and humanities throughout her schooling at Glen Waverley Secondary College. After completing Bachelors of Engineering and Science at Monash University, Kaye explored her developing interest in new methods of medical imaging, completing a PhD in Monash’s School of Physics. Her PhD project explored new techniques that analyse changes in the phase of an x-ray wavefield to image soft-tissue structures like the airways. These techniques provide new capabilities for medical imaging in a clinic, medical research, security screening and non-destructive testing in industry. In 2012, Kaye began a three-year research fellowship at Monash, funded by a Discovery Early Career Researcher Award from the Australian Research Council. Her research developed a new method of phase contrast x-ray imaging that had both the sensitivity to differentiate soft tissues and the speed necessary to capture biological dynamics at high resolution. Kaye collaborated with medical researchers to collect high-speed phase contrast x-ray movies of the airway surface, providing direct feedback on new treatments for Cystic Fibrosis. This research particularly benefited from very bright synchrotron x-ray sources, including the Australian Synchrotron and the SPring-8 synchrotron in Japan. In 2015, Kaye began a Victorian Postdoctoral Research Fellowship at Monash University, a fellowship that incorporates two years visiting a group overseas. Based in Munich, she is working with the x-ray imaging group at Technische Universität München (TUM), supported by her Hans Fischer fellowship from TUM. I love that science can quantitatively answer questions that help us to better understand the world and live in the best way possible. As a scientist, I love working with curious, driven and smart people, I love that no two days are ever the same and I love that there are many skill-sets to develop in the role – creativity, analytical skills, communication, coding, leadership…. 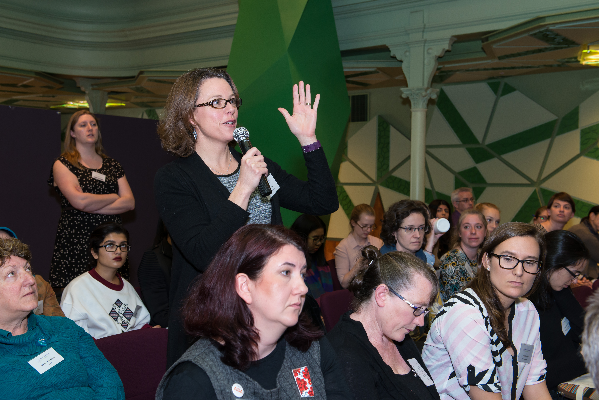 What one thing do you feel that all (public and scientists) can do to most help the position of women in (Australian) Science? Everyone can help to evolve those cultural norms that hold back women in science and society in general – we can all stand up against gender stereotypes, give equal voice to both genders, take equal responsibility for unpaid work in the home and ask for flexible work arrangements. Invest in STEM education and research! Good decision-making in politics and life results from an understanding of science and statistics, and significant economic opportunities result from STEM research (see Australian Academy of Science’s report). I am proud of utilising a combination of physics, mathematics, engineering and computer science to answer a real-world problem. Using x-rays, we can now non-invasively monitor the effects of an airway treatment on the airway surface, and progress new life-saving treatments to patients. That is pretty exciting! I actually think about each case scientifically and objectively. For example, if a grant is not funded, and the granting scheme has only a 10% success rate (which is quite common), it does not mean your work is not worthwhile. I find the best response is not to dwell on failure, but to simply take note of any useful feedback and focus on the next aim.